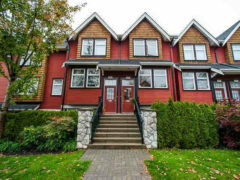 Gorgeous heritage style townhome in walkable Mt. Pleasant offers bright north & south exposure with open plan and SPACIOUS ROOF TOP DECK with stunning city and mountain views. You’ll enjoy the bright south facing living/dining areas that flow to the gourmet kitchen with gas range, granite counters, stainless steel appliances, and large island to the spacious family room and perfect b-b-q balcony on the north side. Enjoy brand new hardwood floors throughout along with high ceilings to take in extra light on those rainy days. Upstairs are 2 well-separated bedrooms and bathrooms with a large master and spacious en-suite. The crowning feature is the private 350 sqft rooftop deck with tons of room to play.